Key legislators in the California Senate sent a message about the importance of early education when they rejected Gov. 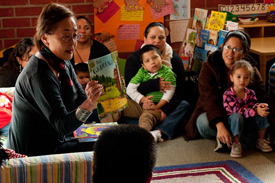 Jerry Brown's proposal to eliminate the state transitional kindergarten program. Headed by Sen. Carol Liu (D-Glendale), the Senate Budget Subcommittee on Education voted against Brown's plans to scrap the fledgling program. Sen. Joe Simitian (D-Palo Alto), the author of the bill that created transitional kindergarten, was on hand to address Brown's staff, who insisted that the proposal was based on policy as well as fiscal reasons. "Then why isn't that in a policy bill going through a policy committee, rather than masquerading as budget savings?" inquired Simitian. Simitian didn't mince words in expressing his thoughts about the proposed elimination of the program he helped create. "This is a proposal to disenfranchise 125,000 kids annually and 250,000 parents from K-12 instruction at an age that they have been eligible to enter our public school system for the past 60 years. If we go down this path, it will be the largest disenfranchisement of public school students in the history of the country to my knowledge." His colleagues concurred, with Sen. Rod Wright (D-Los Angeles) introducing a motion to reject the plan to eliminate transitional kindergarten. The motion passed 2-1. The subcommittee also chose to accept staff recommendations to hold open the other items on the agenda regarding child care, state preschool and children's nutrition programs pending additional information on the state's fiscal picture in May. During this time, committee staff would also continue to evaluate options for achieving savings that have the least impact on direct care. The agenda and outcomes of the hearing are available in full on t he California Senate website site here. The full hearing is available for viewing online at www.calchannel.org. For more information, please contact Ruel Nolledo at [email protected].